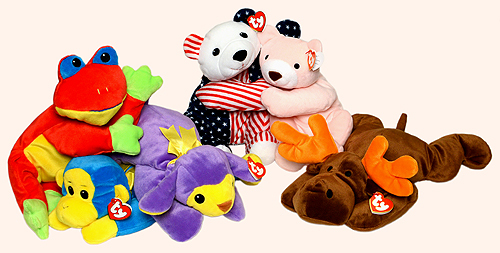 Pillow Pals were the first Ty plush animals designed for babies. They were simple in design with embroidered eyes (for safety). They didn't have body parts or a nose that could be removed and chewed by a small child. Also for safety, there were no beans (pellets) inside. Pillow Pals can be machine washed and line-dried. Ty produced them from 1995 until 1999 when they were replaced by the Baby Ty product line. Pillow Pals are still fun to collect because only 49 of them (includes variations) were made. Two of them have become harder to find; the brown-back version of Snap and the solid green version of Ribbit.